Die formed and chased hollow form. Fabricated with hinged and threaded inner piece, which accepts interchangeable elements. Three interchangeable elements are described below. 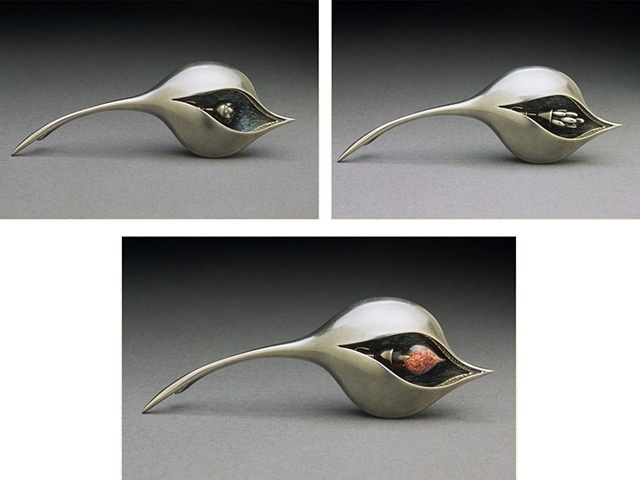 Seed - upper left - Inner silver seed form is styled after a meadow rue flower, which was carried by native americans to elicit love. Pomander - upper right - Inner form is a pomander (scent container) containing crushed rose petals. Vial - lower center - Inner form is a glass pod containing crushed rose petals. The rose being the flower of love and the colors yellow and pink standing for happiness and friendship.